Ultimately, the only items you really need are chicken bones, salt, water, your biggest kettle, and steady heat for a long time. These items are the staple of the recipe, and how my mom taught me to make stock when I was growing up. Thru the years, I have played around with other items to add. My husband can attest to the number of broths I have made him taste! I have found that the addition of an old onion, the starting-to-sprout garlic and the ugly, kind of soft, forgotten carrots from your fridge do wonders in added flavor here. As a bonus-this is a fantastic use-up recipe for these odd veggies before they go bad! I also prefer to use whole peppercorns and bundled stalks of fresh herbs (thyme and parsley) in my broth because the pieces can be strained out after the boil once they have infused their flavors into the broth. 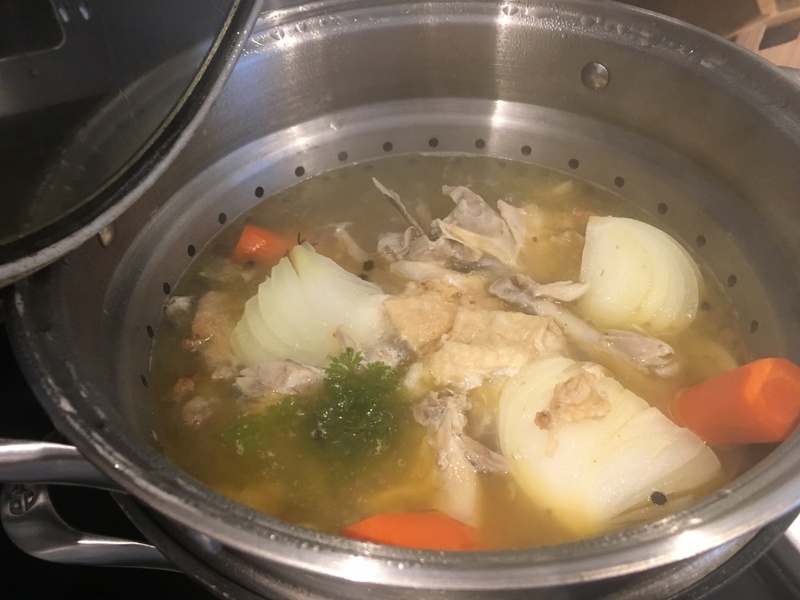 When making broth, I always find the best outcome results when I am using the scraps of at least two whole chickens (three is preferable). I use the bones, extra skin, and any weird parts that come in that pouch sometimes inside the whole chicken. I use the scraps of rotisserie chickens and chickens I have cooked. I keep the drumstick bones if I bought those separately as well as the backbone when I make spatchcock chickens-check back soon for that recipe! Short story: if it is chicken or chicken scrap of raw or baked chicken, you can save it to use for stock. I find that freezing the bones in a baggie of water is the most efficient way to save them. This helps protect the bones from freezer burn while I amass the two to three chickens worth of scraps needed for stock. You can see the difference in the pictures above: the bones on the bottom of the pot (right) were the ones better protected from freezer burn by adding water into the zip lock baggie before freezing (left). The prep for the ‘extra’ ingredients is very basic and these items are so flexible when considering quantities (See the notes below for a few of my well tried suggestions). I simply remove the flaky parts of the onion and garlic (don’t worry about a little bit of the papery skin still attached) and half/quarter. On the onion, I find it is easiest to strain out when you keep the root attached-see bottom right picture just above. I like to peel the carrots, but as long as you make sure the outsides are super clean, peeling is optional. The herbs are fresh from my summer garden, and I simply like to tie them in small bunches so they stay together. When I don’t have fresh herbs available, I take about a tablespoon of dry thyme and parsley and tie it in a cheesecloth wrapping. Once everything is ready, add it ALL into the same pot! Then add water to almost fill the pot, add a lid, and turn the heat onto a medium low. I am using an 8 qt multi pot for this job. The ‘multi’ is really just a stock pot with the extra strainer piece. 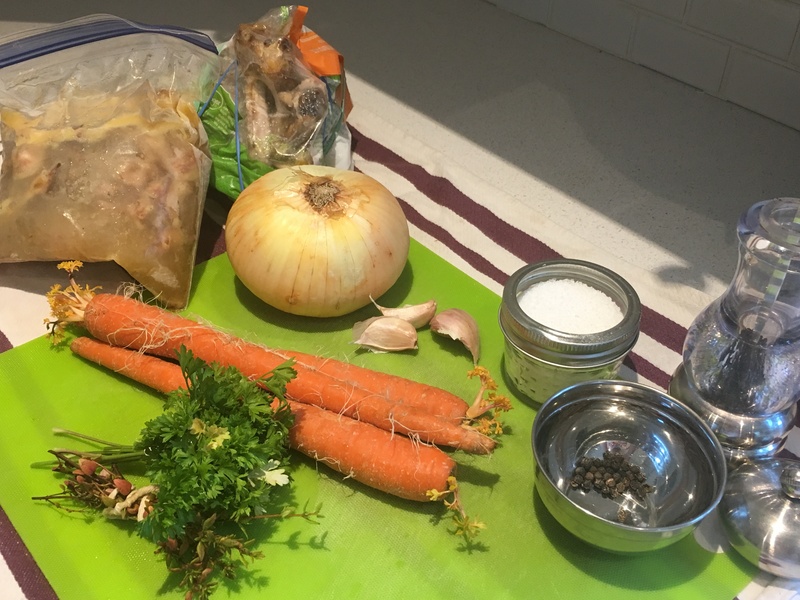 I find it especially great for stock making because ultimately all of the chicken/veggies/herbs will be strained out and this does the bulk of that work all at once. Seriously though, this stock pot is one of the my favorite wedding gifts! Now you wait and check on the concoction every now and again. I like to keep the stock at a simmer, meaning there is a bit of movement and small bubbles but it is not a full roaring boil. I would recommend you let this mix do its thing for at least 6 hours, but I usually let it go for 8-10 hours at a time. The above picture was taken at one hour simmering. The only way you will know your stock is ready is by tasting it. I do this allllllll afternoon when making stock. I cannot resist! The process makes my entire house smell absolutely wonderful! You will likely need to check on the water level and add more due to evaporation. You want to keep a good amout of liquid because it is a long cook time to get as much flavor from your scraps as possible! If needed, you can also add a pinch more salt, but not until it has been simmering for many hours and seems almost ready! Once you have the big pieces of chicken and veggies out of the mix, I highly recommend using a sieve (aka a fine mesh strainer) to get the little bits out also-see above right picture…eww. It isn’t that those pieces are inedible, but I always have a fear of missing a small bone or piece of cartilage if I don’t strain it. Once strained, your broth is ready to immediately make a super yummy soup, sooth a scratchy throat, break a period of fasting, or add to any variety of recipes! My favorite way of saving my freshly made broth is to label and freeze it. I have a super handy bag holder and my ladle measures half cups to make it easy and mess free. This batch, I ended with five and a half quarts of chicken stock! Typically you can four to six quarts of rich stock will come from two ish chickens in an 8 quart stock pot. I also take Rachael Ray’s advice on freezing the bags flat for stacking and easy freezer organization! I hope you have a happy and relaxing stock making day in your future! Simmer some more, and taste it. Add more water as needed. After 8-10 hours (6 is absolutely minimum) broth is ready to be strained! Remove all the big pieces then strain all the little stuff out. In my opinion a slow cooker does not provide enough direct heat to get the flavor out of the bones regardless of cook time, even though ‘high’ is above the boiling point (my manual suggested high was 270). After 12 hours when I tried this I had barely a chicken scented water. Slightly limp celery also makes a good addition to this use up recipe, but I didnt have any this go around. Really, most of your about-to-go-bad-but-are-still-OK veggies can be added to the stock pot, or you can even freeze lots of veggie scraps the same way as the chicken scraps! This is a very flexible and forgiving recipe! This is essentially a full fat broth once finished. I do not personally separate the fat due to my preferences, but if you need to separate the fat it can be done easily. Refrigerate the finished stock overnight after straining, skim the hardened layer of separated fat from the top, then bag it for storage.